May 14, 1940: Judy’s weekly appearance on “The Pepsodent Show Starring Bob Hope” on NBC. This was most likely Judy’s final appearance on the show. The next two were broadcast on May 21 and May 28 out of Chicago and New York respectively. Judy was in Los Angeles working on Strike Up The Band. Newspaper notices on this day noted that it was Hope’s last show broadcast from Hollywood until June 11. By that point, Judy was too busy at MGM to commit to a weekly radio program. 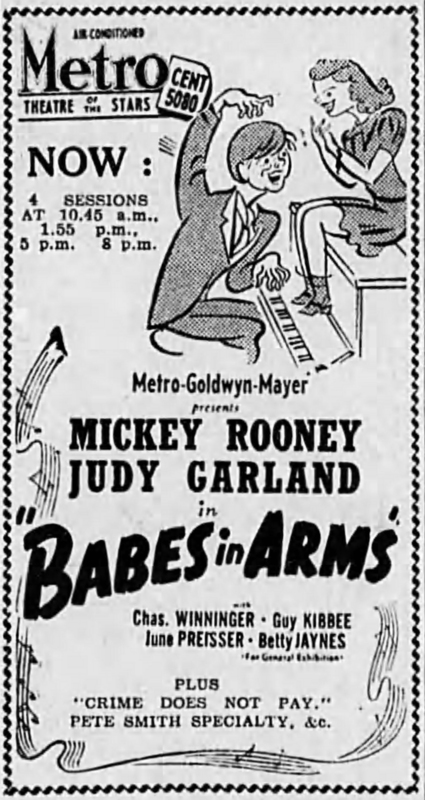 It’s also noted that Judy sang “Carioca” on this broadcast. No recording is known to exist. Judy Garland and Gene Kelly in “For Me And My Gal” – photo provided by Kim Lundgreen. Thanks, Kim! May 14, 1942: Filming continued on For Me And My Gal on the “Interior Jo’s Hotel Room” set. Time called: 10 a.m.; dismissed: 6:15 p.m.
May 14, 1945: A busy day for Judy. First up: A relatively short day of filming on The Harvey Girls. Judy was due on the set at 11 a.m. She arrived at 11:10 a.m.; dismissed at 5:35 p.m. Scenes shot were those on the “Interior Rail Road Coach” set. From 8 to 11 p.m. Judy was at the Decca Records studios in Hollywood recording songs from The Harvey Girls for release as part of Decca’s “cast album” of songs from the film. These Decca recordings were not soundtracks but studio recreations of songs from the film. Judy and the Decca chorus, under the guidance of MGM’s brilliant vocal arranger Kay Thompson, recorded “March of the Doagies” and “Swing Your Partner Round and Round.” Thompson became a lifelong friend of Judy’s as well as godmother to Judy’s first child, Liza Minnelli. When the album was released, “March of the Doagies” was not included because it was deleted from the film. The removal of the song from the Decca album created an uneven number of sides for the album. The intent was to have four discs with eight songs. Decca remedied this by having Judy come in and re-record “On The Atchison, Topeka, and the Santa Fe” on September 10, 1945. The number had originally taken up one disc (two sides) with a recreation of the elaborate introduction by the chorus on the first side (as it is in the film), then Judy’s entrance into the song beginning on the flip side of the disc with her singing the intro “What a lovely trip…” Decca had Judy re-record the song because they deleted that full chorus introduction, so “What a lovely trip” didn’t make sense. The re-recording had Judy singing “What a lovely day.” The final album featured only three discs with six songs. The standard albums of the times were four discs with eight songs. “March of the Doagies” was not released until November 12, 1984, when it was included on the “From The Decca Vaults” LP. To confuse things even more, when Decca began re-releasing Judy’s recordings in the LP era, they mistakenly released the original “What a lovely trip…” version of “On The Atchison, Topeka, and the Santa Fe.” The later re-recording (“What a lovely day”) had its LP debut on that same 1984 “From The Decca Vaults” LP. 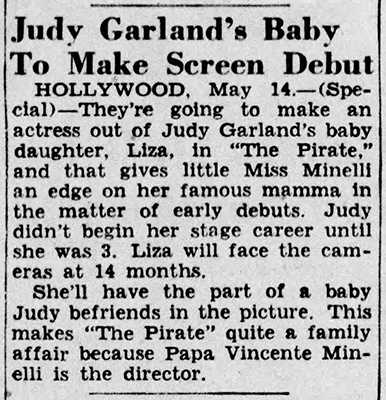 Meanwhile, MGM’s Publicity Department was making the keeping of Judy’s name in the public eye a family affair, with 14-month-old daughter Liza Minnelli rumored to play a baby in the film. That never happened, although Liza did visit the set at least twice, as shown above (photo undated), and also on May 28, 1947, which was extensively covered by an MGM studio photographer. 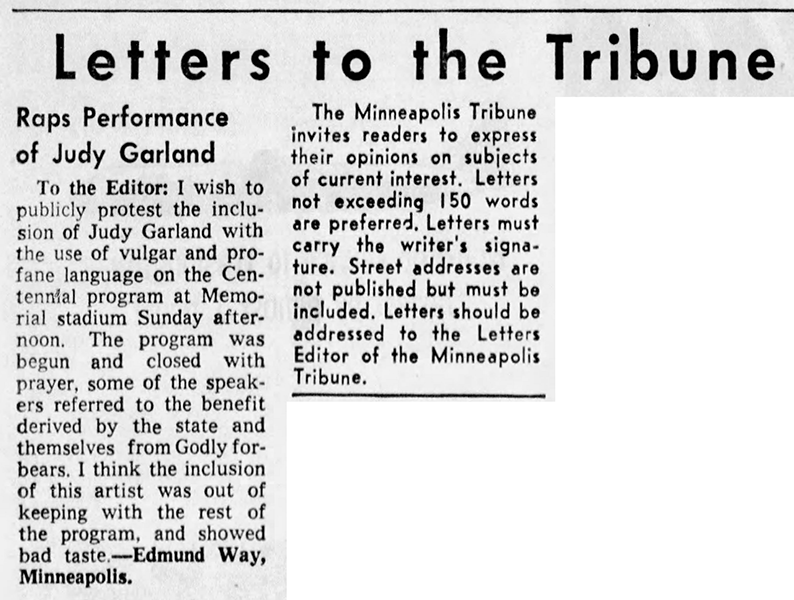 May 14, 1958: In the curio department is this letter to the editor of the Minneapolis Star Tribune by an Edmond Way who objected to Judy’s appearance at the recent Minnesota Centennial celebration in Minneapolis on May 11th. Note that in those days to “rap” meant to give, in this instance Judy’s performance, a “bad rap.” It’s unknown what, if any, vulgar things Judy allegedly said. Knowing how much Judy respected her audience, she certainly wouldn’t have said anything inappropriate. May 14, 1961: This review of Judy’s May 8th concert in Dallas was reviewed by Sue Brandt McBee for the Austin American paper (Austin, Texas). It’s a week later but better late than never! And once again, Judy’s weight is mentioned. There is also an early mention of the newly christened infamous “Judy Garland Cult” and another aspect of her fan group, “the believers.” By the end of the decade “the cult” became a negative slur aimed at the more hysterical, usually gay male, fans who attended her concerts. After her death, the cult continued and can now be found, still being hysterical, in various discussion groups on social media. Monday night in Dallas, the mammoth STATE FAIR MUSIC HALL was packed. Every seat in the balcony was gone. The boxes were filled. Finally the deep-sunk orchestra pit was jammed with people. 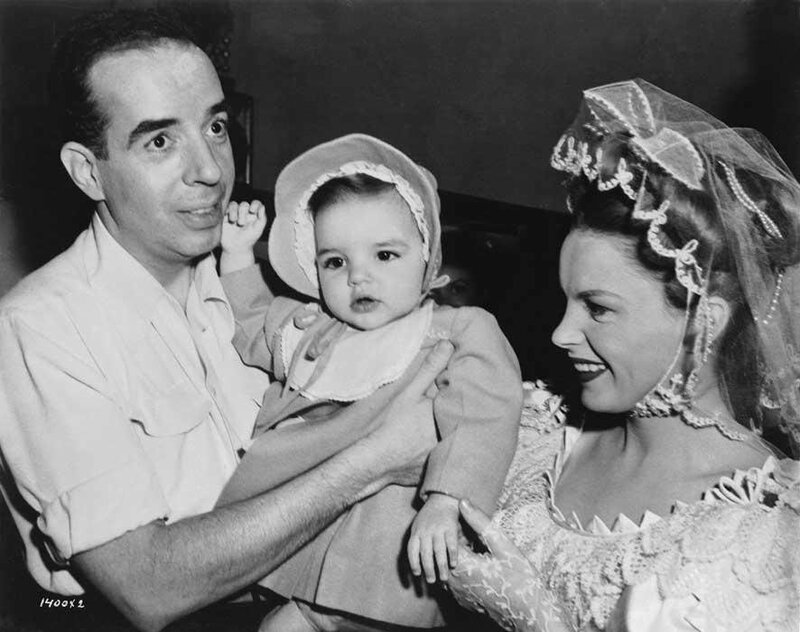 For the second time in less than three months, JUDY GARLAND was in town. Thirty minutes past curtain time the star strode onstage. True to advance reports, she was plump, her face considerably rounder than it had been in “A Star Is Born.” She wore a slim black sheath topped by a loose-blue satin jacket. Her legs, shown to advantage by a knee-high skirt and black suede pumps, were as gorgeous as ever. 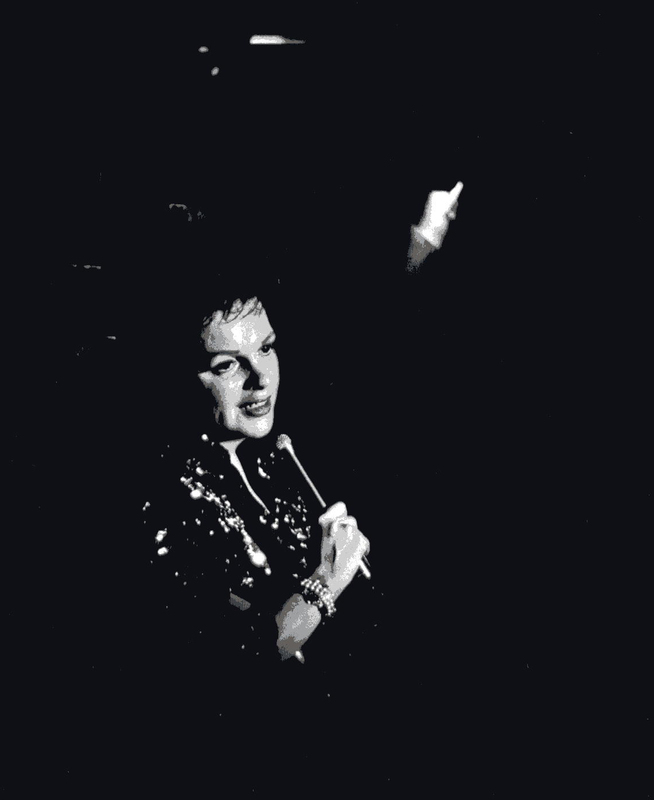 When JUDY GARLAND appeared, there was a standing ovation. During the two-hour performance, there were six or seven more. She had to sing her jazzed-up version of “San Francisco” twice. And when the show was over, it appeared the crowd would never let her go. A double contingent of guards was assigned to protect her from the overly enthusiastic as she left her dressing room for her car. Well, you can count us in. JUDY GARLAND has the quality – what do you call it, star quality? – possessed by a handful of great entertainers. AL JOLSON must have had it, and ETHEL MERMAN, and MARY MARTIN. This is a quality, a something, not dependent upon great vocal range nor upon physical beauty. It does require talent plus a genuine love of show business – and it comes across the footlights to hold an audience in the palm of its hand. Monday night in Dallas, JUDY GARLAND was backed by a large, sometimes irritatingly blarey, band. For one group of intimate songs her only accompaniment was from a piano. There were no dancers and no gimmicks. In her only costume change, at intermission, she replaced her dress with a pair of slim black pants and a glittery overblouse. She punished her voice and sometimes it cracked under the strain. She repeatedly mopped her brow. She took a pill on stage. She kidded with the musicians and helped them move drums. Informality, one might put it, was the keynote of the event. But when she belted out “Swanee” or “Trolley Song,” the audience stood up and yelled, and when she sang “The Man Who Got Away,” [sic] you could have heard that pin drop. Has JUDY GARLAND had health problems? Marital problems? Weight problems? Career problems? Nobody in Dallas’ MUSIC HALL Monday night could have cared less. Somewhere over that rainbow, for JUDY GARLAND, was a big pot of gold called Applause.